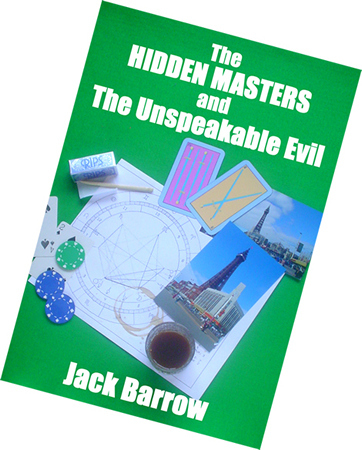 The Hidden Masters and the Unspeakable Evil contains many mysteries, mostly relating to how three middle aged pauncy blokes can drink that much and still manage to save the universe. However, occasionally the book contains insights into the world of paganism and the occult. One such pearl of wisdom, from Chapter 2, covers the subject of Astral Travel. For some years now The Three Hidden Masters, two from Hemel Hempstead and one from Bricket Wood, had cherished a theory about astral travel which goes a bit like this. Many people say that it is possible to leave one’s body and travel on the astral plane to visit other places while the practitioner’s body stays put. There is also an idea that there is a silver astral cord which connects the astrally projected presence back to their body. However, there are differing ideas of how this works, and about whether it is possible to visit places that exist in reality. The question is always one of verification. This is a philosophical debate, which is a bit odd in itself because the old pie and chips experiment is probably quite easy to set up, so it ought to have been resolved by now. However, none of our heroes had ever met anyone who had successfully identified someone buying pie and chips once, with or without a side order of Coke. On the few occasions when they had heard of someone who had tried this sort of experiment the results had been less than clear. For example it turned out that the character Pete, who I have just made up for the purposes of this illustration, was in the habit of buying pie and chips on most nights. Thus it would have been a good guess that he was going to be in the chip shop anyway. Of course, a specialist in the philosophy of science such as the Grumpy Wizard of the West might suggest that this is all nonsense. You see, his perspective would suggest that the fictitious character, Pete, is likely to be so fat, having undoubtedly eaten all the pies, that he is the first person anyone would see when approaching the chip shop from either the astral plane or anywhere else. Actually he wouldn’t say that, but what he might say is far less likely to be amusing. What is really needed is something so unlikely and easily verifiable that there can be no mistake. So imagine you astrally projected around to Queen’s Square—apparently so named because she opened it in her coronation year of 1952, though I don’t suppose she remembers—and found Fat Pete being arrested for having broken into the Post Office to get some money to buy pie and chips. During your astral vision, there was a reporter photographing the event for the local paper which came out the following Thursday, with Fat Pete the Post Office burglar all over the front page. Then you might say that this was all so unlikely that it had to be verifiable. In this case, you could go up to the Grumpy Wizard of the West and say “Ahhhaaaaaaaa!” But then again, he’s not known as the Grumpy Wizard of the West for nothing, and even then he might try to wriggle out of it. You see, the Grumpy Wizard of the West is one of those magicians who does not actually believe in magic. Anyway, that’s the sort of argument you will hear in the debate on astral travel when you talk to many magicians, witches, scholars of the mysteries and the like. On the other hand, there will be those who will resist all attempts at debate on such matters, and will never examine an issue in case they discover something they don’t like. However, our heroes saw the old astral travel debate in a completely different way, for they had come up with another explanation. They had noticed that amongst their magician friends there was often an unbreakable bond to the place where they lived. Usually this bond would go deeper, attaching them to a particular location in their home, namely a favourite chair—often with a good view of the TV—known as the ‘god spot’. Now, The Three Hidden Masters, two from Hemel Hempstead and one from Bricket Wood, had this theory that the bond attaching the magician to his god spot was where the idea of the astral cord had come from, and any idea of astral travel was just a development of that concept. On the occasions when they had observed magicians abroad in the world, such as visiting friends far away, they had noticed that there seemed to be some sort of pull on the magician which tugged him back towards home at the earliest possible opportunity. After all this philosophising, and the odd bottle of dark rum, our heroes had concluded that the much-debated practice of astral travel, along with the idea of the silver cord, had come from this truth that they had observed. The travelling magician is attached by a length of silver elastic, which connects him to his god spot and, inevitably, returns him there before too much time has passed.